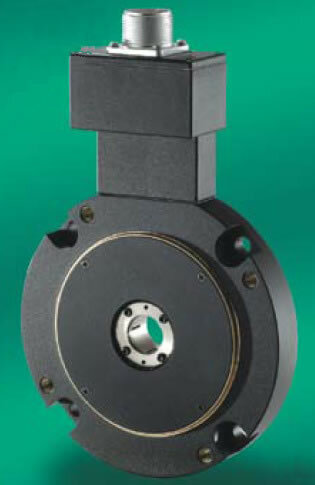 Model TAC017-000 C-face encoder is a rugged, high resolution encoder designed to mount directly on NEMA C-face motors. Both sides of the encoder are C-face mounts, allowing additional C-face devices to be mounted to this encoder. Unlike many C-face kit type encoders, model TAC017-000 contains precision bearings and an internal flex mount, virtually eliminating encoder failures and inaccuracies induced by motor shaft run-out or axial endplay. The advanced Opti-ASIC design provides advanced noise immunity necessary for many industrial applications. This encoder is ideal for applications using induction motors and flux vector control. The model TAC017-000 provides speed and position information for drive feedback in a slim profile – only 0.975” thick. The Thru-Bore design allows fast and simple mounting of the encoder directly to the accessory shaft or to the drive shaft of the motor, using the standard motor face (NEMA 56C). The tough, all metal housing resist the vibration and hazards of an industrial environment. For more information about this edge guide sensor, call 1-888-286-8614 or e-mail us today! Model TAC017-000 by Carotron, Inc.